L’Apogée Courchevel, part of Oetker collection masterpiece hotels is situated in the exclusive resort of Courchevel 1850, in the heart of the French Alps. Nestled in the peaceful woodlands at the highest point of Le Jardin Alpin it is a step apart from the hustle, giving guests a true Alpine atmosphere. 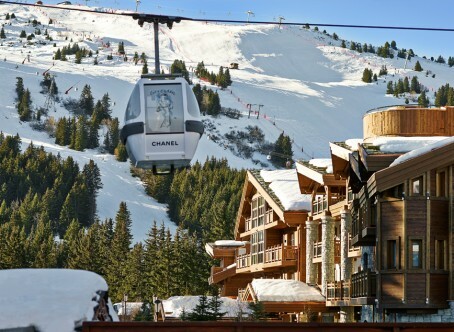 As a ski destination Courchevel 1850 is renowned for its extensive slopes challenging all ability levels. For the convenience of the guests there’s a private conveyor belt to deliver guests back from the ski slopes. The in-house ski room offers the hotel’s own custom-made skis, while the boutique beside it sells boys’ toys, such as a watch with a €525 price tag . Each room is furnished with handmade materials. Bathrooms are finished with designer showers and deep soaking tubs. The underfloor heating provides a comforting touch for tired toes and continues through to the balconies. Two fabulous staircases frame the main restaurant, Le Comptoir de L’Apogée, a scene dominated by a wall of windows overlooking the ski slopes. The resort’s Champagne Bar offers an original champagne menue, as well as coffee, tisanes or light lunch snacks for guests only. The hotel bar, Le Bar de L’Apogee, offers artisanal cocktails and accompanying canapés, as well as a light lunch menu. The fitness centre has first class gym equipment, with professional trainers and physiotherapists. The Kids’ Club, the largest in Courchevel, provides entertainment and thrills for tots to teens.